From conventional cotton production, which uses a staggering amount of pesticides, to petroleum-based toxic dyes, to exploited factory workers, there are many reasons that it is past time to transform the way we get our clothes. From their origins in Northern California, Fibershed is trying to do just that. Their long-term vision is “an international system of regional textile communities that enliven connection and ownership of ‘soil-to-soil’ textile processes.” To get there, they are developing regional regenerative fiber systems and working with farmers, ranchers, natural dyers and mills to implement carbon farming, rebuild regional manufacturing and connect us all more closely with the landscape that grows what we wear. Fair World Project’s Anna Canning sat down with founder Rebecca Burgess to talk a bit more about her vision for strong, local fibersheds all around the globe. At Fibershed, your mission is to develop “regenerative fiber systems.” Can you talk a bit just about what regenerative fiber is, before we even get to the systems part? There are two ways that we work to develop regenerative fiber. One is to take a more traditional Life Cycle Assessment (LCA) approach, where you are tracking carbon literally on a molecular level through a cycle, focused mostly on above-ground emissions. But we have looked at that model, and we have identified that when you are looking at fiber – or food, or anything grown in the biosphere – there is a bigger carbon story than just emissions. Instead, one ought to consider the relationship between the atmosphere and the pedosphere (the soil carbon pool) to really get an understanding of the net impact, from a carbon perspective, of a food or fiber product. Can we track the additional carbon that they are now drawing down from the atmosphere to the soil because they have made a change in land management, for example, or because they have put in a windbreak that they would not have put in if they were not thinking about carbon capture? Maybe they start asking about where hedgerows come in, or silvopastures, where you put trees into the grazed landscape. Or cross-fencing, to help create smaller, more dense spaces for rotational grazing. Or maybe they put in water infrastructure to help animals get across the landscape and keep them hydrated, keep them moving. We are working off of about thirty-five practices like that, but there are so many, depending on your landscape. We track those practices, and then we are able to assign numbers to the carbon associated with them. For example, in the case of one ranch with whom we are working, we take the practices that they are implementing and then total up all the emissions from their operation – the sheep shearing, travel costs, electrical use for the equipment, etc. – and do a big subtraction so that, in the end, we can calculate that each pound of wool represents approximately 6-9 pounds of carbon in the soil. Can any natural fiber be regenerative? Regenerative to me means that you are putting more into the system than you are taking out. I think cotton, hemp, flax, wool and alpaca all have the potential to be regenerative. I think it is possible to grow it, but we are going to have to factor in the true cost of the carbon capture, the water quality enhancement, and all the things that happen when someone is doing it right. That means that we are going to have to start paying a lot more for our clothing – and that is a whole bigger question of behavior shift that I do not think many people are ready for. We can do all the work to grow it, but we really have to change our relationship with consuming these materials and start buying fewer better quality products. Clothing is great because it is non-perishable and can have longevity. Our current economy is not incentivizing us to do any of that, however. Can you now talk a bit about the “systems” part of your mission and tell us how this fiber fits into a larger vision of a fiber/clothing system that combats climate change? We envision a “soil-to-soil” model for our clothing (see diagram below). We are still working to build a supply chain that fully hits the mark, but we are getting there. Our Wool Mill Vision lays out what that could look like: to mill the fiber using living machines systems and constructive wetlands to return that water back to your mill, to use geothermal and wind energy to help power the machines, as a few examples. 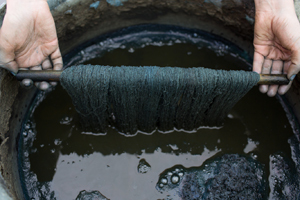 We also focus on natural dyes, because they are not heavy metal- or coal tar-based, as well as just using wool and cotton that are the natural color of the plant or animal from which they came, and not even using dye at all. We have focused so much on building regional fibersheds because transportation and distribution are really important. That has been one of the biggest challenges we face: how small can you build a mill and still be profitable? We are starting to see that it can be done on a regional basis, but it poses economic challenges, and the price point of the finished goods become a bit higher. Tell me a bit about how you envision the local fibershed concept scaling up or scaling out? We have about thirty-eight national fibersheds established, and currently there is a total of about fifty-four around the world. My vision is that each of these communities understands what their working landscapes are most capable of producing in a climate-friendly way, starting from the soil up. That means, for example, that the Pacific Northwest could become famed for their bast fiber production, as flax grows readily there and does not need to be irrigated in the summer. And Kentucky could become well-known again for hemp production, and the West could return to being a profitable wool producing region. My vision is that each of these systems builds truly from the grassroots up, based on soil, water and community; and that they design their infrastructure around what is possible, given the attributes and constraints of their community. There are so many steps to an apparel supply chain, and so many of them are full of exploitation on a global scale. How have you addressed that within your Fibershed model? Everyone we are working with utilizes domestic production, and we are working on such a small scale that we basically have 100% transparency with whomever we are working. We go into all the mills; we know the people who own them and the people who work in them – they are friends and comrades and colleagues. We do not really have a dividing line between white and blue collar – it is one fibershed. Within that colleague-oriented, transparent framework, we have never once run into a labor issue. I could have missed something, of course, but it would be really small. Do you believe we should create a regenerative organic certification program for fiber production? I think we should set soil carbon goals for farms and ranches, and also boost the existing standards for organic to include soil carbon gains. Scientists are saying that we have 8-10 years to do most of the work needed to become carbon-neutral, which means that we are going to have to improve everything: the regional systems that Fibershed is growing, which have a lot of trust and relationships imbued within them, and the global supply chains that are reliant on labor in countries that do not have the same kinds of standards that the more developed nations have. So, standardization and certification will have to come into play. I am a bit nervous about how that will come to be, though, and how it will get overseen – but that is the same issue with all certification programs. Personally, I am more comfortable with communities trying to own this work, because of the intimacy they have with their soil. We really want to change mindsets around growing fiber; we want them to come at it not because they are trying to meet a certification’s goals, but because they are simply trying to do good work. And, in the end, we just need people to do good work on the land. How do you recommend that people get involved and bring more regenerative, climate-beneficial fibers into their wardrobes? As a starting point, look for things that are made of 100% natural fibers: wool, cotton, hemp, linen or silk. That is important because you can technically compost a t-shirt or some underwear, for example, made from those fibers. 70% by weight of the clothing in our wardrobes has some form of nylon, polypropylene or other fossil fuel-derived substance in it. That means that a lot of us are wearing plastics, and plastics really do not fit into the soil-to soil model. In fact, they create a lot of problems for those of us who want to see our clothing return as nutrients and carbon back to the system. 100% organic cotton is important, too, because organic cotton has a 40%-lower carbon footprint than conventional GMO cotton, which has a lot to do with the amount of herbicides and pesticides used on a conventional field. In addition, 97% of the cotton grown in the U.S. today is GMO-based, so if you do not want to support a GMO project, you have to choose certified organic cotton. As far as other “natural” fibers go, I do not make a strong recommendation towards tree pulp or very high lignin fibers like bamboo or modal, as they are very, very chemically intensive to produce. And, of course, you can look for your local Fibershed members in our online directory – we have a list of both local producers here in Northern California as well as affiliates across the U.S.